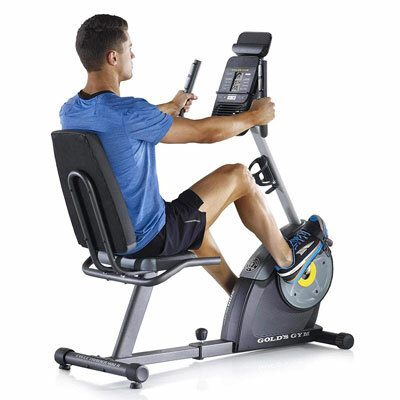 The 400R is one of the Gold’s Gym recumbent bikes released in 2015. Although it is not exactly the newest, it’s still available and still continues to benefit from a decent feedback from users. When it comes to resistance system and console, it can be compared to the ProForm 235 CSX, but features a two-piece frame, just as the Body Champ BRB852. 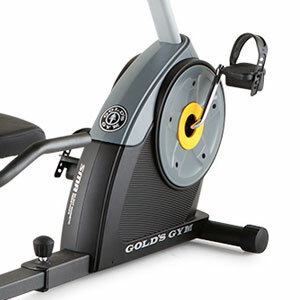 The Gold’s Gym 400R features a sturdy frame made of steel tubing. It combines ovalized, rectangular, and cylindrical bars in its construction for a more aesthetic aspect. However, it’s body also incorporates several ABS plastic part, such as the covers of the flywheel. The Gold’s Gym 400R is a bike made for home use, this being one of the reasons its frame is not extremely heavy. It weighs approx. 80 lbs (36 kg), though, which is more than twice the weight of the average road bike. Due to this weight, the unit provides excellent stability. Plus, its rear base bar features adjustable stabilizers. Once the bike is fully set up, its relocation can be done with ease via the small wheels integrated into its front base. The bike’s frame consists of two main pieces, the rear piece with the seat, and the front piece which holds the resistance and drive elements, as well as the main mast and the console. The two pieces connect at the middle; the longitudinal tube of the rear part has several adjustment positions and connects to the front part via a large knob. An important aspect that needs to be mentioned here is that the bike features a step-through design. This type of construction offers an easy entry and exit which may be quite a plus for users with certain disabilities or elderly users. The bike isn’t extremely large but still take approx. 52″L x 24″W (132 x 61 cm) of floor space with the frame fully extended. It is also recommended to leave at least two feet of clearance all around the unit for ease of access and safe usage. The paint finish of the frame is highly resistant to corrosion and abrasion. The color used is dark gray, with the Gold’s Gym logo painted white. These are the only colors available for this recumbent exercise bike. As we’ve mentioned above, the bike’s frame is made of two pieces attached at the middle. Therefore, in order to adjust the seat, you simply have to unlock the two piece and extend the bike’s frame. The seat itself is not attached to an adjustment rail like for the Tunturi E50-R Performance. It connects directly to its rear post via several screws. Due to the seat front-to-back adjustability, the bike can accommodate users between 5’0 and 6’2″ (153 – 187 cm). It also has a fairly durable construction, being rated for a user weight capacity of 275 lbs (125 kg). On the other hand, the seat is designed to provide optimal comfort. 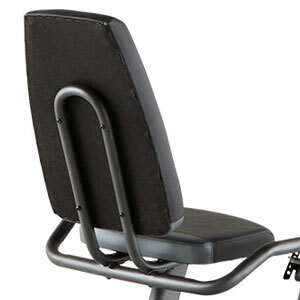 Both the backrest and its bottom section integrate a thick (~2″) layer of foam padding. Also, their upholstery is made of a durable vinyl material which should last for many years of use. The bike integrates two sets of handlebars. One is attached to the front mast, one directly to the seat assembly. The front handlebars integrate metallic pulse sensors so the console can monitor your heart rate if you hold on to them. The console mast is set to a fairly sharp angle compared to other recumbent bikes; therefore, holding on to the front handlebars won’t result in an awkward position. The rear handlebars have a rather simple design. They don’t have any sensors, just the rubberized grips for a secure hand positioning. 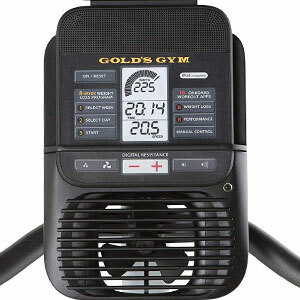 The Gold’s Gym 400R recumbent bike has an eddy current resistance system which involves a magnetic flywheel and a servo motor. The resistance is automatic; it can only be adjusted from the console, and if one of the preset programs is in use, the bike will auto-adjust the pedal tension. Evidently, the bike requires a power source to make the tension levels available, which can be either four D-type batteries for the console, or a power adapter 100-240V AC 50-60hz 0.3A which is not included. The adapter is the ICON part number 337717. The bike’s resistance system makes available 16 distinct tension levels. The first few levels deliver a light pedaling difficulty which can be great for users who may need recovery training. Conversely, the 15th-16th tension levels offer quite a bit of difficulty, simulating a hill climb. The weight of the internal flywheel is not specified, but considering the bike’s overall weight, it should be somewhere between 10-20 lbs (4.5-9.0 kg). 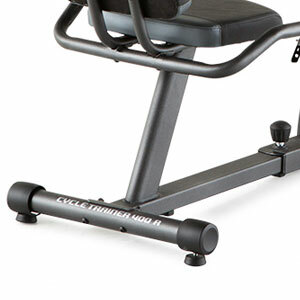 The flywheel is balanced and delivers a steady pedaling motion with a very low impact on the joints. It is also bi-directional, which means the bike gives you the possibility to pedal in reverse, and benefit from the same resistance. The bike’s drivetrain involves a poly-v, heavy-duty, abrasion-resistance belt. It delivers a very smooth and quiet pedaling motion. Vibration during pedaling is almost inexistent. Also, since the bike uses a belt, not a chain, you don’t have to go through the hassle of periodic lubrication. Last but not least, the Gold’s Gym 400R features a fairly large pulley, with two solid steel crank arms. The pedals are made of a durable nylon material; they have a metallic core and a weight element which enables them to always turn up if you remove your feet from them. They’re also equipped with adjustable straps. The bike’s console features an LCD display with three main windows, similar to the console of the ProForm 135 CSX upright bike. Its top window indicates speed in revolutions per minute (RPM), the power output in watts, and your heart rate when you use the handlebar sensors. It also shows the resistance level for a few seconds when you change it. The display shows each one of these metrics for several seconds. The console offers 16 preset programs, divided into two main categories, Weight Loss and Performance. Even though these programs are preset, you can still enter setup mode and make adjustments if you want. There is also an 8-week Weight Loss Program available on the console which has controls for each week on the left side of the LCD display. Of course, the unit also makes available a Manual Mode which allows you to freely adjust the resistance during pedaling via the “-” and “+” buttons. The console is not iFit enabled and does not have online capabilities. So, in case you’re looking for such features, you may want to have a look at the 400 Ri model. The console has three other notable features. These are the cooling fan, the sound system, and the tablet holder. The sound system consists of two small speakers placed at the top of the console. It also has an audio jack output to which you can connect your iPod, MP3 player, or smartphone in order to play your music through the integrated speakers. There are also volume controls for it. The cooling fan is fairly large compared to the ones on other bikes. It is placed at the bottom of the console and has several intensity levels, with the controls next to the sound volume ones. Finally, the tablet holder is placed at the top of the console; it is large enough to accommodate any tablet or smartphone. The front section of the bike which holds the drive and resistance elements comes already assembled. However, you still have to connect the two main pieces together, attach the base bars, the seat, the console mast, the console, the handlebars, and the pedals. This may take more than an hour, but the manual provides very clear assembly instructions. Also, a basic toolkit for assembly is included. Since the bike features a magnetic resistance system, there isn’t any maintenance required for the internal parts. So, the only things to do for this matter are a periodic check for loose bolts and parts and keeping the unit clean. A power adapter is not included. 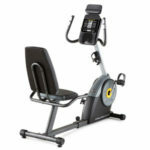 The Gold’s Gym 400R is a mid-range recumbent bike designed for home use. It has a motorized magnetic resistance system with 16 levels available. Its console features 16 workout programs and one 8-week weight loss program. It has a fairly sturdy construction and delivers optimal comfort. In all, it’s a fairly decent exercise bike, great for light to medium intensity cardio workouts, recovery training, weight loss, muscle toning, and stamina development.